DEAR MAYO CLINIC: I’ve had arthritis for years, but the place where it bothers me the most is in my ankles. I’m considering ankle replacement surgery, but I’ve read it’s risky. How do surgeons determine who is a good candidate for this surgery? How long is the recovery? I am 58 and otherwise healthy. ANSWER: Ankle replacement surgery is a complex procedure, and it’s typically used only after other treatments haven’t worked. Carefully reviewing your situation with your doctor to determine if you’re a good candidate for this surgery is critical. Full recovery from ankle replacement surgery can take up to a year. 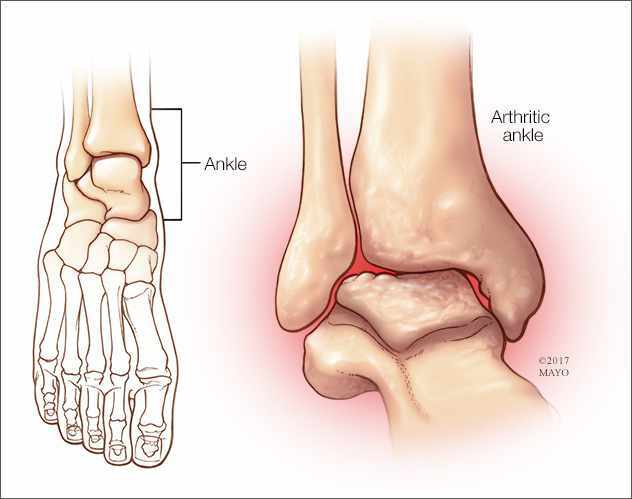 Treatment for arthritis in the ankles frequently starts with pain medication, such as anti-inflammatory medicines, a brace or other support, and physical therapy to strengthen the muscles around the ankle joint. In addition, procedures such as cortisone injections or lubrication injections may offer relief. If those steps are not enough to reduce ankle arthritis pain and other symptoms, surgery may be appropriate. The two surgeries frequently recommended are ankle fusion and ankle replacement. In ankle fusion, a surgeon fastens together the damaged ankle bones with metal plates and screws. During the healing process, the bones fuse into one combined bone. 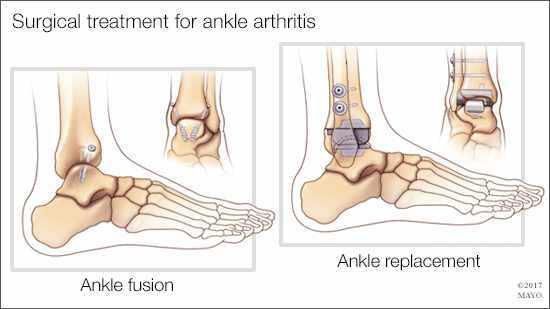 Ankle fusion usually is successful in relieving arthritis pain, but it also reduces the ankle joint’s ability to move. To make up for this, nearby joints may have to move more. That increases the risk of developing arthritis in those joints. Ankle fusion is more common than ankle replacement because, in general, it lasts longer and doesn’t require as many long-term activity restrictions. Fusion usually is recommended for younger people with more active lifestyles. In ankle replacement surgery, the ends of the damaged bones are removed and replaced with a joint made of plastic and metal. This artificial joint helps the ankle retain more movement, so there is less risk of arthritis developing in nearby joints. Ankle replacement tends to have more risks associated with it, however, than ankle fusion. And the results of this surgery may not last as long as ankle fusion for some people. But ankle replacement surgery does provide more mobility. In the right person, ankle replacement can be an excellent choice. In general, ankle replacement is recommended for people older than 60 who don’t participate in high-impact activities, such as running, and who are not overweight. The surgery may not be a good option if you have weakened ankle ligaments, misaligned ankle bones or nerve damage from diabetes or other medical conditions. After replacement surgery, your ankle will be in a splint, and you’ll need to use crutches. You won’t be able to put any weight on your ankle for several weeks. After that, you’ll likely start physical therapy and slowly move to weight-bearing activities. Most people need some type of splint or brace on the ankle for at least three months. It may be a year after ankle replacement surgery before you’re able to return to all of your normal activities. Ankle replacement requires bone to grow into the artificial joint so that the new joint can work correctly. If that doesn’t happen, significant complications could occur. They include ankle weakness, stiffness or instability, as well as loosening or dislocation of the artificial joint over time. If any of that happens, you may need another surgery to replace or remove the artificial joint and possibly fuse the ankle instead. I had the ankle fusion procedure done when I was 66 (in 2014) weighing in at 225 and it was the best health decision I ever made. There is some restriction as far a bending in the ankle error but it is far, far, better than the impairiment that a bad ankle does to your entire gait and pressure placed on other bone joints. Now you have to really be disciplined enough to go forward with physical therapy whether by a pro or your own determination. I was realistic about the difficulties that the post-surgery period presented. It took about 3 months to get around comfortably and 6 months to start light exercising. IT WAS WORTH IT!